There are many pros and cons of buying a parrot, and I think this is the post that actually inspired me to begin this blog in the first place. What started me on it at all was our poor, psychotic cockatiel, whom we bought from a pet shop. With a lot of time, kindness, and patience, we brought her to the stage where she is comfortable being handled. She loves coming out of her cage now. 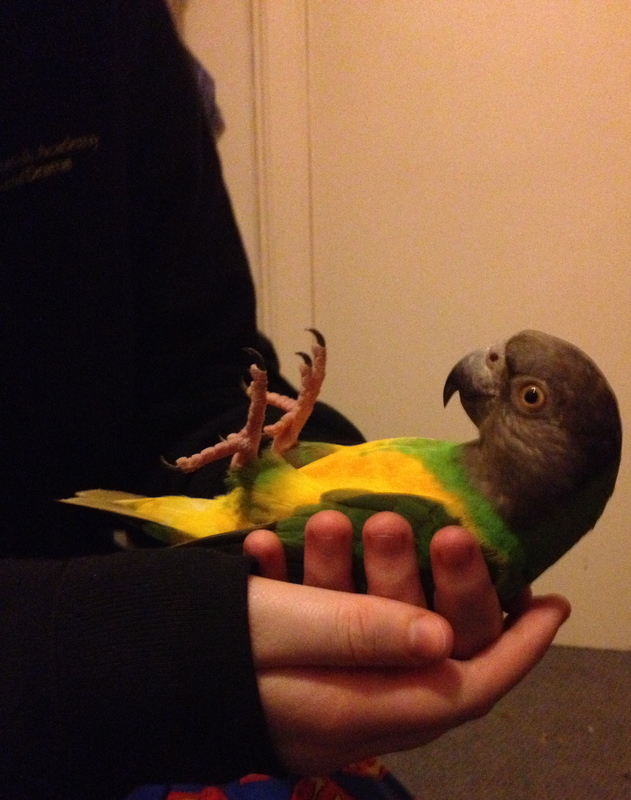 It wasn’t always this way, though – and she was definitely not an ‘easy’ first parrot. As someone who’s always owned pets, and who’s worked with animal rescues for most of my life, I feel very strongly about educating the public on the complexities of parrot ownership. We currently have five birds – parrotlet, cockatiel, canary, umbrella cockatoo, and senegal parrot. They each bring their own challenges, but they also bring a lot of happiness into our lives. Below, I’ve listed some aspects that come up in every day parrot-owning life. I don’t think of them as ‘cons,’ but instead as points that we need to be aware of. If you’d like an abridged version – a bit shorter – go here, or, if you’re interested in canaries and finches, here. Noise. Even our Celestial parrotlet can make lots of it, and his noises are mere squeaks compared to a cockatiel’s shrieks. 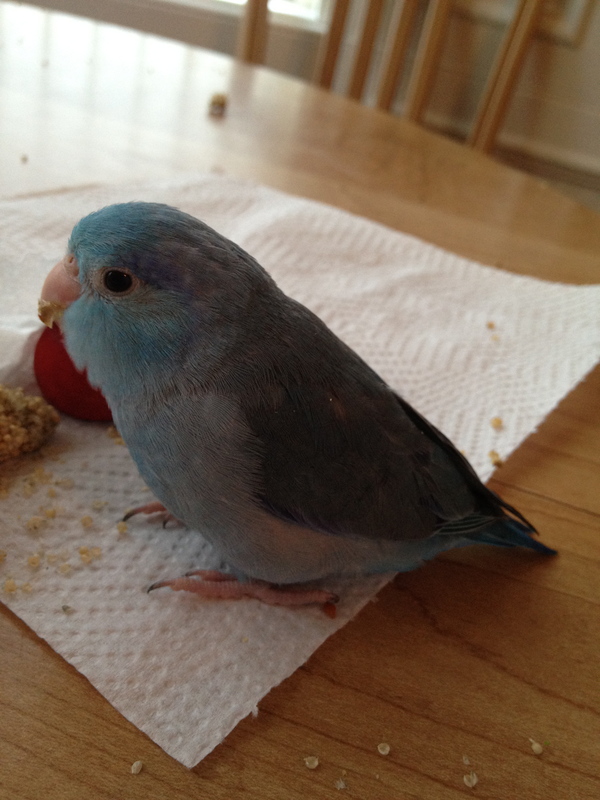 A parrotlet’s cries can piece your ears. A Senegal’s can pierce concrete walls, and a cockatoo’s can carry for 3 miles. Mess. Birds depend on a clean environment – yet they are incredibly messy. Bits of seed and pellets will be found stuffed in every other nook and cranny imaginable. The walls will be coated in the food they fling, and the floor in the debris of their toys. In the wild, their food flinging is a wonderful thing – it helps the environment by spreading seeds. Not so much in a house. Birds also release dust particles when they preen, plus moult once a year. Owning parrots will change your life. The care regime for a parrot requires dedication. It typically starts for us with training, followed by a nutritious breakfast, then everyone has a shower with me before we spend quality time exploring and playing (around three to four times a day, per bird, for an hour each time). You’ll take your bird out for walks in his harness or carrier, as well as cook for him twice a day. Proper care helps him stay the happy, tame, handleable family pet you want. Diet. Unfortunately, you can’t simply offer seed or pellets alone to your feathered companion – there is a fair amount of cooking involved. Good nutrition prevents health issues, prevents mood swings and biting, and helps a parrot grow beautiful feathers. Birds on a bad diet may lose their feathers or begin to pluck (also bite and scream). Raw veggies and some fruits in moderation are a great start. Learning to properly feed your bird can be a huge challenge. Toys are a must. First and foremost, any bird, budgie or macaw, needs toys in the cage. Parrots are given incredible minds, and suffer if they can’t use them – and even simple finches require toys for good health. A bored parrot will bite, scream repetitively, or pull its feathers out. Expense. It starts out with a steep initial cost, as parrots themselves aren’t cheap. The cages they live in are pricey, too, and the toys they need can break the bank: they’ll need new cage accessories every two weeks or so. Then there’s food, vet, etc. It all starts to add up after awhile. Danger. Yes, for big birds (like Bobo, our umbrella cockatoo), there is an additional risk. These parrots are so large, and function at such a high level of instinct, that they present danger to you – experienced owner or not – and your family, pets, and friends. You might adopt a baby bird who is utterly trustworthy, but once it hits adulthood, expect issues. 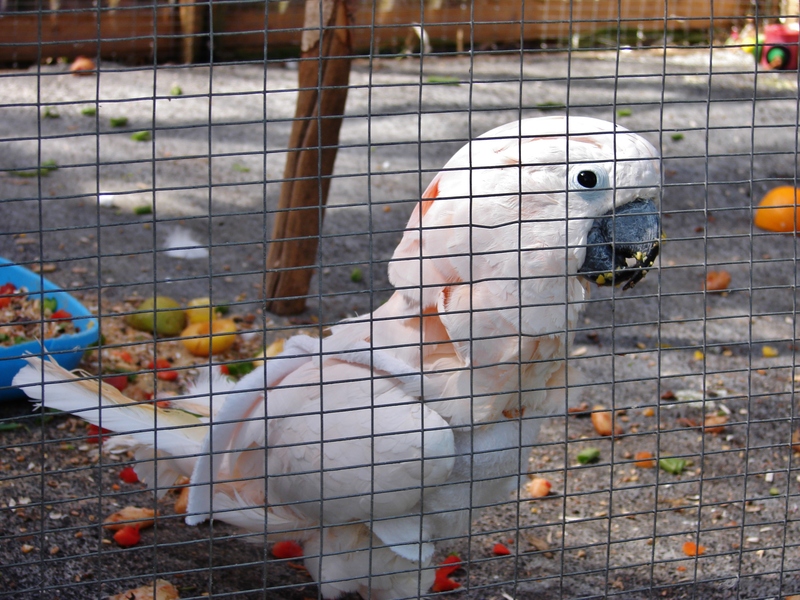 You will want to find a rescue or parrot group, and learn how to restrain your bird in case of attack. Flying. Clipping your bird’s wings does it a huge disservice. Flight is the most natural form of exercise, obviously, and many birds will become depressed, obese, and unhealthy if not allowed it. You do not need to clip your bird’s wings to tame it. Clipping can actually hurt the taming and bonding process, as suddenly the ‘flight’ option of fight-or-flight is taken away. All your bird can do now is bite. The disadvantage of a flighted parrot is that it can get into everything. Trying to mind a parrot is like trying to watch a toddler. No smoking, please. If you’re a smoker, be careful to do it outside and away from your bird. Second hand smoke is devastating to a parrot’s sensitive respiratory system and can cause plucking and residual health issues. It’s a lifetime commitment. Parrots live a long time. Budgies and parrotlets can live 15-25 years; bigger birds have been known to survive for well over 60. Damage to your home. Large or small, those beaks are deceptively strong. It is a parrot’s instinct to chew, and nothing will stop that – the damage is simply not its fault. They can gnaw through a piece of furniture in the few seconds when you turn your back. Parrots will also put holes in your clothes, walls, lampshades, mouse mats, and anything left lying unattended. Rearrange your lifestyle. This is possibly one of the biggest issues for some people. No longer can you use aerosols, scented candles, and nonstick appliances – and leaving the windows open, amongst others, is out. Birds also make fabulous alarm clocks. They dictate when you wake up, go to sleep, and what you do, when you do it. After all that, there’s also the inability to up and leave town on a whim. Birds manipulate you. Even the smallest parrots are highly intelligent, and not at all a ‘simple’ pet. All parrots know instinctively how to control their humans. It’s not just the cute looks when they want something, it’s the well-placed bite to make us go away, or the shrieking and screaming when they want to come out. Even well-trained parrots bite. Their love may shift on a whim. Because birds are self-serving creatures, they select favourite humans – often they will just ‘click’ with one person, and no one will will be allowed near them or their chosen one. Parrots will shift their loyalty instantly if they feel they’ll get more of something they desire from someone else. Your bird may never talk. But it will scream; they vocalise at dawn and dusk and sometimes just to let you know they’re happy to be alive. Have kids? Owning parrots is often compared to bringing a toddler and accompanying tantrums into your house – for life. Parrots also tend not to be great with children, either, as their naturally high energy level and fast-paced movements can make your pet go… batty. Or bite-y. Hormones. Every year, around twice a year after reaching sexual maturity, parrots become vastly different from two-year-olds in the sense that they desperately want to mate. They generally become much more difficult to handle. The hormonal seasons are just something else to take in stride. Parrots will bite, scream, lash out without warning, and become more moody and aggressive. No cuddles, please. Tying into the previous point, one of the biggest triggers of hormones, and something to avoid at all costs, is the petting and cuddling of an adult bird. If you want an animal for those things, you probably want a cat or dog. Only mates touch outside of a parrot’s head/neck and foot areas (it’s sexual), and once your pet sees you in this role, it will want what you can’t provide. When you inevitably fail to do this, your bird will turn on you in frustration. If you don’t take care of them properly, they will develop problems. Biting, plucking, and screaming… Unhappy birds can have many behavioural issues. Truthfully, sometimes, even if you’re doing everything right, your pet will do these things. It’s true that even just being hormonal in the spring can bring on the dreaded behavioural issues. 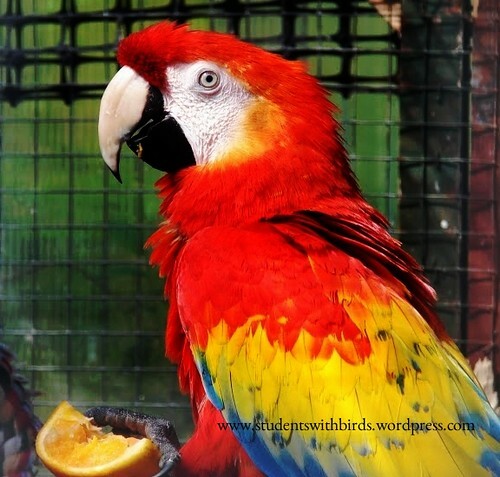 Captive parrots need your time, love, and respect, and if you can’t give a set number of hours – a good estimate is 3 hours, minimum, to keep a single pet bird pliant and happy – towards that each day, a parrot is probably not for you. They are rewarding pets. Parrots bring along a lot of trouble and stress, but the feeling when your bird overcomes one of its challenges is one like no other. The bond between bird and human is also very special. They are very beautiful. Enough said. Personality! Each bird has its own personality and individual quirks. No two are alike. Their complexity is a wonderful thing. These animals wouldn’t be so engaging if they were cage ornaments. They bring their owners joy when they experiment and explore and use their keen minds, and that’s something to be treasured. When you overcome the prey instinct and forge a bond together, few things can compare. A bird choosing you as its person means that it finds you trustworthy – possibly one of the truest compliments possible. Birds are ice-breakers. Have a bird? It’s an excellent way to meet new people or even just strike up a conversation with strangers. When you take your bird out on walks – a wonderfully enriching activity – everyone will want to stop and meet him. Keep warm/cool. You will never need to take your parrot out in the middle of the night and stand, freezing or roasting (whichever) while it decides where to poop. Oh, speaking of that? Bird waste doesn’t stink. Doesn’t mean you don’t need to clean the cage daily, though. Apartment safe? This is a pro and a con. 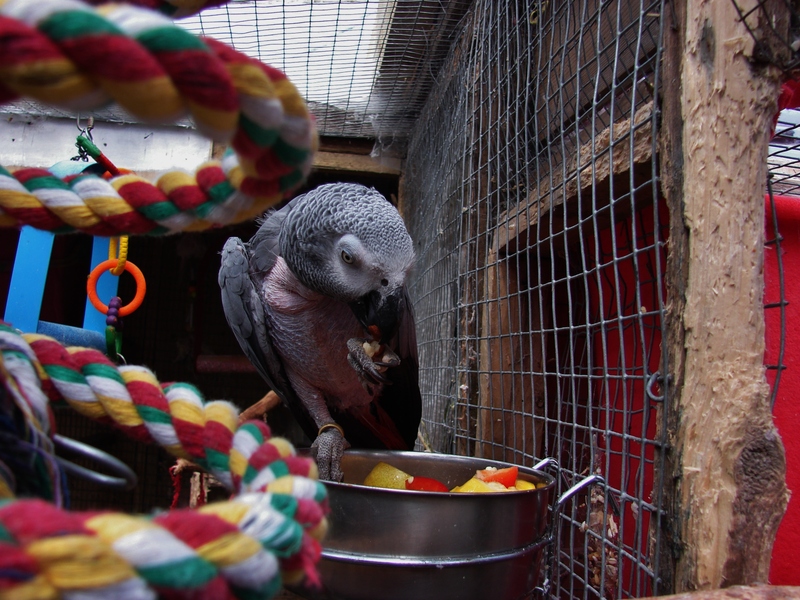 Flats and other rented accommodation will often allow caged birds over cats and dogs, BUT parrots are very destructive, and if they chew through your rented place, you’ll find yourself in pretty big trouble. They’re also noisy and not good with neighbours, but don’t require the same space a dog does. Having read all that, ask yourself a final question or two: Are you ready to commit to 60+ years of life-changing dedication to a creature that will bite and scream and poop everywhere? Is your life circumstance likely to change in the next few years – and if so, will you still be able to provide for one of these beautiful creatures? You can read more from the Feathered Friend avian rescue, here. Should you still be intrigued – if this doesn’t scare you off! 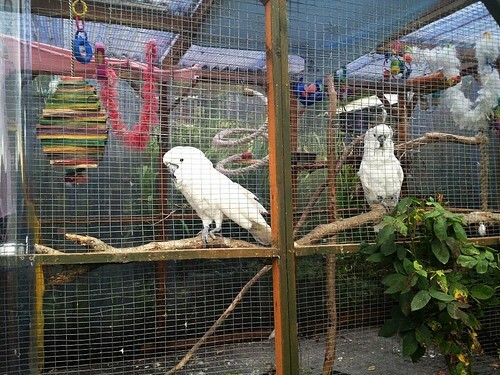 – and ready to take the next step, try volunteering at a local parrot rescue. You’ll get a good feel of how life with avians goes – noise, mess, tantrums, and some of the more charming aspects, too! I can’t stress how important volunteering is. Some people quickly find that life with parrots isn’t for them. It will be a lot of work, it will be exhausting, frustrating, always messy, and sometimes very rewarding. And if you think after everything that you’re ready, good luck! There are some more posts here, on this blog, that may help you in your journey of adopting a bird. Ptak practises his mind-control on me. Dealing with Behavioural Issues in my Bird. Thanks, I dunno about ideal, but we try! 🙂 I think budgies are great birds. So many people write them off, but they’ve got big personalities. Hi, after reading your article on parrots I am dissuaded from buying one. Thanks for the very informative articles. And thanks for reading! Parrots can be excellent pets – if you’re fully prepared and ready to put up with all the things that come with them! They’re constant challenges, though, and not the kind of simplistic animals many still envision.Thanks for stopping by! Wow, your pro and cons are just wonderful. And well said. I have a 21 year old male blue and gold macaw, Taz, He is the best buddy, and most challenging. But all things considered, I would not trade him. But I am also very quick to caution people who see how cool he is and ‘want one too’, that large parrots are not, repeat, not for everyone. And then I can step into the few, but important cons to owning these guys. I like your article very much. Thanks! Aw, Taz sounds adorable. I know that blue and golds are known for being amongst the most emotional of birds – they fascinate me. That’s amazing that you can educate people through him! Thank you so much for this article. I fell in love today with a cockatiel at the pet store. We connected in such a great way. Sadly, after reading this, I have changed my mind about going back to buy him. I simply don’t have the time and inclination to devote. I had no idea what a time commitment it is! Thank you! I worry about the number of birds being sold in my area to young folk who are entranced by these very young parrots. People defend the seller saying that she does educate the potential buyer but I wonder in 2 – 5 – 10 years …I wish the bird breeding industry would just slow right down. We have so many unwanted birds in rescues as it is. Lovely insight into the ownership of a bird. I’m not put off by the cons as everything in life has its cons. the only things putting me off is, I live alone and I’m out of the house 12 hours a day. is it wrong to leave them alone for half the day? ?